We're rearing the end of October with a lot of accomplishments under our belt. The Bray Road Beast was released earlier this month. It's now an Amazon best seller for over three weeks with peaks where it hit #1 New Release in horror and documentary! A very special thank you to our 2018 Kickstarter backers and all of you who've supported Small Town Monsters and The Bray Road Beast film. In other news, Small Town Monsters began moving our production offices into a new space in Downtown Wadsworth last week. We're still in the process of moving, but the end is in sight! We apologize for any delays in email responses, etc. that the move may cause. We're very excited about this new space and the growth that it allows. I'm sure we'll be sharing more information and photos as soon as we're settled. 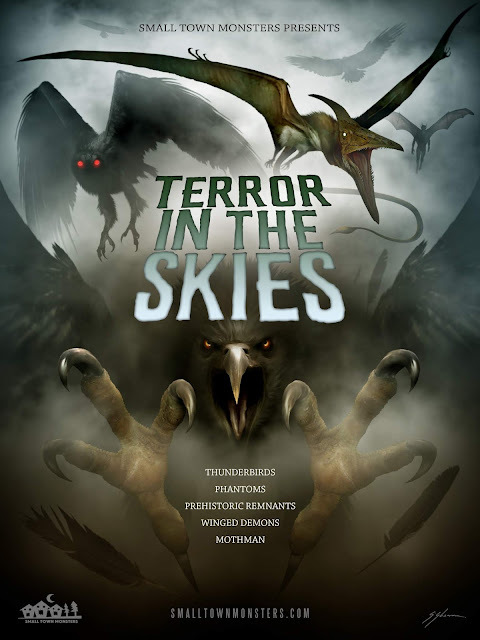 Squeezing in one last big announcement for the month, we revealed the official poster (above) for Terror in the Skies earlier today, artwork once again by the great Sam Shearon. Terror is officially in post-production and we're very excited about it. You can expect this film in the Spring of 2019 and you can get involved in the project by backing our 2019 Kickstarter next February. For additional details (and handy reminders) about the Kickstarter, check out our Facebook Event Page here.